Pizza Fridays have become a tradition in our house. It started when my husband was coaching football, we would pick up pizzas for after the game to watch the local “Pigskin Report”. Then when we adopted all of our boys, they couldn’t wait to eat until 10:00 pm (go figure), so pizza was an easy and cheap dinner on our way to the games. Now that the Hubbs has taken some time off from football, Pizza Friday has stuck and we just order the pizza. The kids know that if its Friday – there will be pizza. We usually keep it cheap by ordering with coupons or by picking up at Costco – but sometimes to change it up, we make them at home. It’s a fun change for the kids and, frankly, it’s better for us. Because we keep a well-stocked pantry we typically have all the supplies we need on hand to make them. I buy whole wheat pita bread at Walmart and freeze several at a time. They do not need to be thawed before making the pizzas, so I pull them out right before we are ready to start dinner. 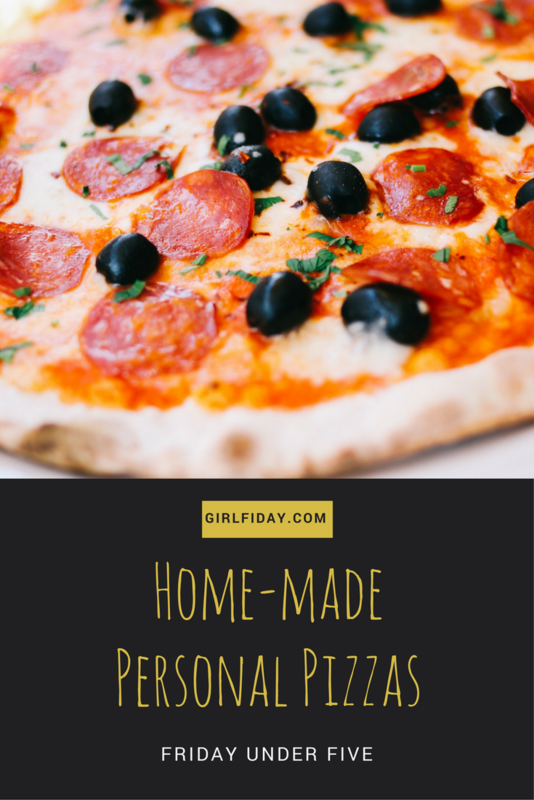 I use spaghetti sauce, which is always in my pantry, for the pizza sauce and I top the kids’ pizzas with shredded cheese we also always have on hand. The kids are simple – they prefer to just have cheese. For the grown-ups, we keep several different items in our pantry and refrigerator to make our pizzas super-yummy and fun. My absolute favorite is sundried tomatoes. I keep a jar in the fridge or the pantry at all times. The julienned ones in oil are the best. You can also top with other fresh veggies you might have on hand; onions, peppers, mushrooms, as well as any protein or cheese you want. We no longer eat meat (not that it was not delicious) but were meat-eaters for several years so most of our suggestions have meat/protein options. Salad is a good side for this meal as well. Sounds delicious doesn’t it? The Hubbs, who is known to be persnickety at times, has even remarked, “these are better than take-out.” Hubbs approved – score!